U.S. sales of the Fusion sedan dropped 12 percent in July to 20,522 as Ford's plant in Hermosillo, Mexico, struggles to keep up with demand. Despite capacity constraints that crimped sales of some best-selling vehicles, Ford Motor Co. sales rose 11 percent in July, the best July sales since 2006. "Lean inventories on some of our hottest vehicles muted the increase," said Erich Merkle, a Ford sales analyst. The Fusion mid-sized sedan has been most affected by shortages as the plant in Hermosillo, Mexico, has struggled to keep up with demand. 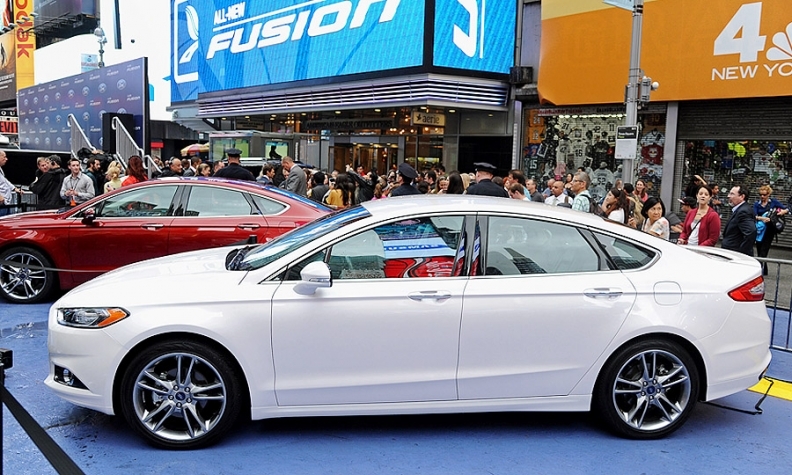 Fusion sales dropped 12 percent in July to 20,522. Ford is hiring 1,400 workers and will begin making the Fusion at a second factory, in Flat Rock, Mich., this fall. Retail sales of the Fusion, which was redesigned for the 2013 model year, have risen sharply in California and Florida, said Ken Czubay, Ford's North American sales chief. Fusions are not staying around dealer lots for long, he said. "Fusion Titanium is turning at 12 days in Miami, 14 in San Francisco and 16 in Los Angeles, with the Fusion Hybrid at slightly more than 10 days in these markets," he said. Ford also experienced shortages of the Focus, Escape and Explorer. Strong sales on the coasts have contributed to the lack of supply, Ford said. "The lack of inventory for some of the key vehicles really ended up hurting Ford from having stronger sales results," said Alec Gutierrez, senior analyst at Kelley Blue Book. "Once inventory improves for Ford, we'll start to see improved sales from not only their small vehicles and large trucks, but growth in the mid-sized and crossover vehicles." Ford got its biggest sales boost from trucks, which are not capacity-constrained. Ford F-Series sales jumped 23 percent to 60,449 as customers continued replacing aging pickups and the construction industry improved. Ford small-car sales rose 32 percent for the month. Ford counts the Fiesta, Focus and C-Max in the category. Fiesta sales increased 89 percent for the month to 7,667, the largest increase of any major Ford nameplate. A re-engineered 2014 Fiesta is now arriving in dealerships. Focus sales rose 2 percent to 16,764. Sales of the Lincoln brand dropped 1 percent to 6,919. That means the Ford Fiesta subcompact outsold the entire Lincoln brand in July. Sales of the MKZ, Lincoln's biggest seller, dropped 7 percent to 2,809. Czubay attributed the drop to a strong sell-down of the 2012 model month last July. He said MKZs are turning quickly at dealerships. The MKZ was redesigned for 2013. Two Lincoln models had sales of fewer than 1,000 units — the MKT at 437 and Navigator at 633. MKS sales rose 18 percent to 1,038.